KNOM has won the National Association of Broadcasters’ Marconi Religious Station of the Year Award! You can imagine how thrilled we are. Of course, the most precious awards are the loyalty of our listeners and the support and friendship of good people like you. We are deeply grateful for your prayers and your financial help. Without both, our mission would not be possible. Thank you! May you enjoy a happy and blessed Thanksgiving. 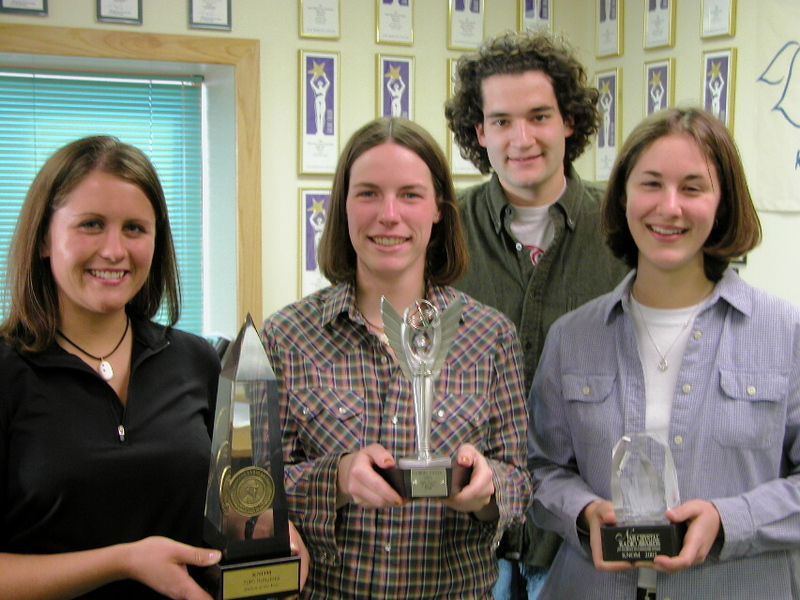 TRIPLE CROWN: (left) KNOM volunteers pose with our mission’s three top national 2003 awards. From left, Amy Flaherty holds the Marconi Religious Station of the Year Award, Emily Barrett holds our Gabriel Radio Station of the Year Award, and Anna Dummer holds KNOM’s Crystal Award for Excellence in Community Service, while Clinton White joins in. Each of these is a major honor. It’s a tribute to the quality and dedication of our staff that KNOM is the only radio station to have ever been presented all three of these awards in the same year. Thank you for making our important work possible. It is because of you that our mission continues as a powerful beacon for families who live in isolated Eskimo and Indian villages. 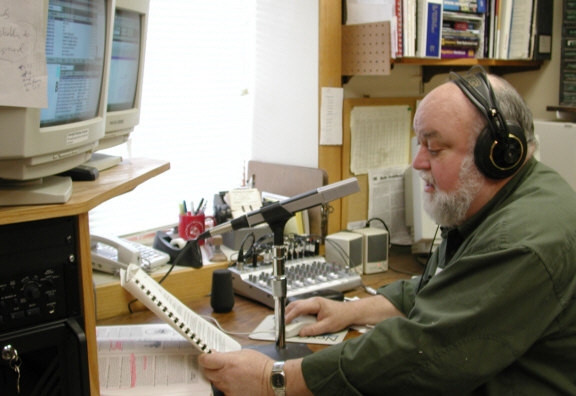 KNOM is the oldest Catholic radio station in the United States, beaming inspiration, education, information and positive entertainment 24 hours a day throughout 100,000 square miles of remote western Alaska, thanks to you. INSPIRATIONAL SPOT: We must be a manufacturer of hope, in a place where there is often a lethal absence of it. Not just proclaiming the message of Jesus, but becoming it in this world. May we never stop. COPYCAT: (left) KNOM deputy news director Julia Dunlap reviews news copy prior to the next hourly broadcast. A volunteer since August 2002, Julia hails from Lakeview, North Carolina. 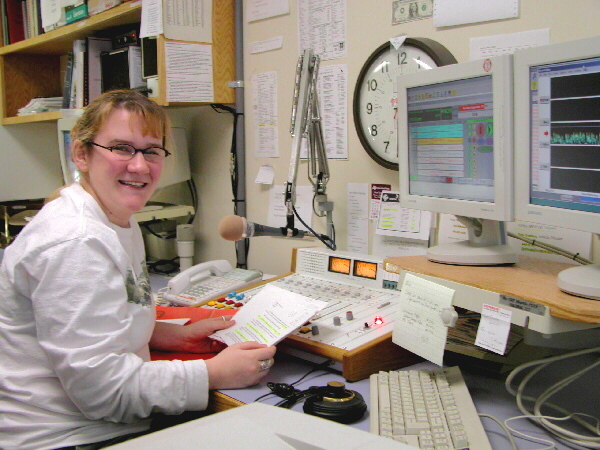 The KNOM newsroom is “where I live,” Julia says, although you’re just as likely to find her at a meeting, in Studio C anchoring a call-in program, or in one of the area villages. SPEAKING ABOUT THE UNSPEAKABLE: In mid-October, KNOM volunteers Emily Barrett, Julia Dunlap and Clinton White were all assigned to cover a four-day regional conference on the subject of suicide. Participants at the meeting included experts on suicide from other areas with large native populations, including Nunavut, the Pine Ridge Indian Reservation, and New Zealand. Statistics from western Alaska are horrifying. Rural Alaska Natives are fifteen times more likely to kill themselves than average Americans. The problem is especially severe among young men between the ages of 15 and 25. While they don’t succeed as often, according to experts, almost 4% of Alaska Native teenage girls attempt suicide at least once. Because of the nature of the topic, KNOM approached it sensitively and carefully. As you know, this is one of the endemic tragedies that our mission is working to eliminate. Our goals are to educate, to inspire and to bring hope. It’s a long, long haul. INSPIRATIONAL SPOT: I am a pencil in God’s Hands. INSPIRATIONAL SPOT: The daylight shadows grow long, the tundra is frosted over, and snow covers the red and gold of autumn. The birds have fled and the carpets of summer blossoms are withered and gone. Lord, as nature shuts down into darkness for the long winter, please be my Light. Shine in my heart and in the hearts of those I love. Keep us in the warmth of Your Presence always, and in the Light of Your Love. FAREWELL: In early November, we bid goodbye to KNOM engineer Les Brown (right). In the photo, Les is pre-recording the midnight-to-six AM program. His deep, resonant voice has been a KNOM hallmark. Following a KNOM volunteer year in 1972-3, Les embarked on a career in television studio equipment marketing. Starting in 1990, he spent his annual vacations helping the station. In 1997, he retired, took a huge drop in salary and rejoined KNOM. A licensed broadcast engineer since 1967, Les’ hard work over the past six years has made tremendous improvements in the reliability of all of the electronic systems at the station. Thank you, Les! He will be greatly missed, especially by general manager Tom Busch, also a licensed engineer, who will assume Les’ engineering work. We know that Les will remain a close advisor to the KNOM staff. Please join us in praying for Les as he and wife Paula return to California and begin a new phase in life. REACHING OUT: Many parishes throughout the Lower 48 are major supporters of our mission. If your parish has a mission outreach committee, could you please ask them to consider contributions to KNOM? FAIR CATCH: That’s what we’re hoping for, as in September and October, KNOMers spoke with several dozen idealistic young people at college volunteer recruiting fairs. Many of the students had never heard of our work and were intrigued to learn about it. Some were mildly curious, and a few seemed genuinely interested in volunteering for our mission. In order to save money, and based on past years’ successes and failures, we pared back our travels to six colleges this year. Thanks to information from other Catholic charitable groups, we hope to add one or two more in 2004. SPOT CHECK: A major element of KNOM’s programming is short, effective inspirational spots. Since January, we’ve aired approximately 31,150 inspirational spots, and an equal number of educational ones, thanks to you. INSPIRATIONAL SPOT: It breaks your heart to see the sadness and misery that comes to a family when they lose someone to suicide or some other senseless violence. It’s a hurt like no other. But just being sorry isn’t enough. Lord, inspire us to action before it’s too late. INSPIRATIONAL SPOT: If all we take care of is “Number One,” we won’t add up to very much. “AND THAT’S THE WAY IT IS” (left) We received this photograph too late to include it in last month’s newsletter. 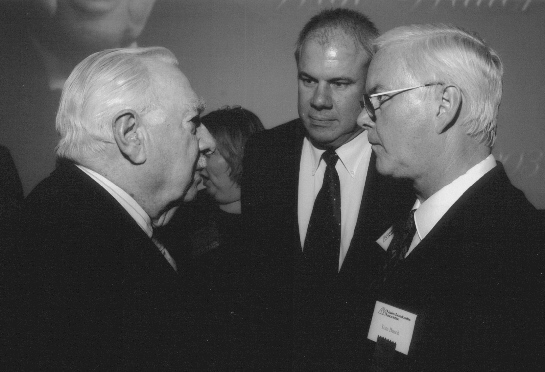 At a special dinner in Anchorage, KNOM program director Ric Schmidt (center) and general manager Tom Busch spoke with the event’s honoree, Walter Cronkite. Cronkite is a long time friend of pioneer Alaskan broadcaster Augie Hiebert, who helped establish KNOM. COSTLY: As we’ve written before, Nome’s isolation makes for high prices, as almost everything must be shipped in by air. In a location where bananas are $1.69 a pound and a single medium-sized onion can run more than two dollars, you can see that we don’t often eat fresh bananas and onions! According to the University of Alaska, the cost of living is about double what it is in most parts of the Lower 48. At the KNOM mission, we operate as frugally as we can, but there are some costs over which we have no control. For example, it costs $948 to power our transmitter for one week. One week’s Associated Press service costs $284. Fortunately, we have the generosity of our five full time volunteers. Last year, the entire cost of transporting, housing and feeding one volunteer for one year was $8,521. We ask you to join us in prayer for these wonderful young people, who, along with you, make our work possible. THIRTY YEARS AGO: In November 1973, KNOM was expecting a full house for Thanksgiving, with several former volunteers planning to visit. However, a Nome blizzard forced planes to overhead the town. One of those former staff was the chief engineer of station KIAK in Fairbanks, Tom Busch, who found himself back in the big city, stuck with 20 quarts of fresh milk that he’d packed in luggage, intended for the KNOM volunteers. As we hunker down for the coming winter, we once more thank you for your kindness. Your prayers and your support are what keep our mission’s work alive and strong. Your gifts make up 96% of our income. Individually, and together at our weekly staff meetings, we remember you and your intentions in our prayers. We pray that Our Lord holds you close. God bless you!